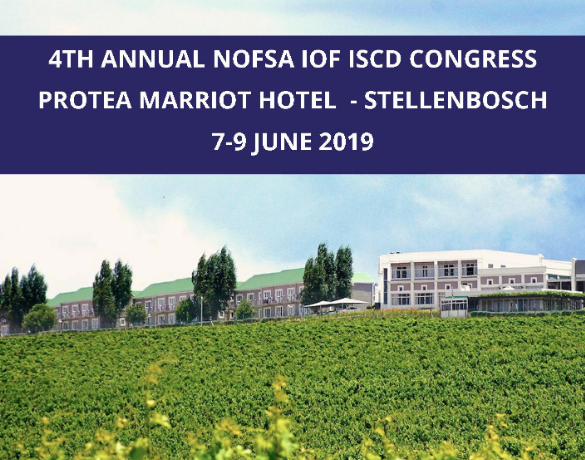 The annual National Osteoporosis Foundation of South Africa’s congress is taking place from 7-9 June at the Protea Marriot Hotel, Stellenbosch in the Western Cape. Registration is open and includes access to CPD courses and international speakers. The annual NOFSA Congress will be held at the Protea Marriott Hotel in Stellenbosch from 7-9 April 2019. Registration is now open at www.osteoporosis.co.za. The congress will host a dual-energy X-ray absorptiometry (DXA) course, used to measure bone mineral density and delegates will have hands-on-training. This year’s congress has a distinctly local flavour with some of the country’s leading experts sharing their knowledge. Speakers include Profs John Pettifor and Bilkish Cassim, Drs Stan Lipschitz, Tobie de Villiers, Wimpie de Lange, Zane Stevens, Magda Conradie, Sue Brown, Graham Ellis and Mike Davey. Via electronic or cash deposit. Please send your proof of payment to finance@osteoporosis.org.za or fax (021) 976 4999. Delegates attending the NOFSA conference 2019 will be able to scan for CPD points. For more information or to register, go to www.osteoporosis.org.za.